WEST HARTFORD - It was during the offseason summer workouts when Devon Bishop summed up what the New Britain football team wanted to accomplish this season. 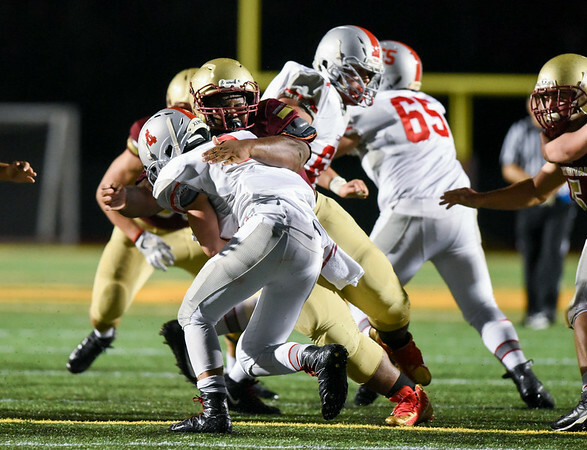 “It’s time to show people our worth,” the senior defensive tackle said a few weeks before Friday night’s season opener against Conard. It might have been only the first week in a long season, but the Hurricanes played a way that had been missing for the majority of time throughout the past three years - which each ended in 5-5 records - with some amount of consistency. And when the team walked off the field, cheering and celebrating after the 35-0 win, the players knew it was a good start. It was a much different feeling than New Britain had in 2017, when the Chieftains scored 22-answered points to win 30-22. That night, the Hurricanes were gashed on long runs up the middle and screen passes. On Friday, there was none of that. New Britain’s defense had something to say and more importantly, to show. Conard managed just 98 yards of total offense, Chieftain quarterback Matt Langevin was sacked four times and Conard collected just seven first downs. The closest the Chieftains came to scoring was at the five-minute mark of the first quarter before an illegal man downfield penalty took that away. Langevin completed 13-of-20 passes for 82 yards and an interception. He also for a team-high 22 yards on 14 carries, while the Hurricanes gave up just five plays of 12 yards or more. It helped that, unlike last season, once the ball was on the move the defense swarmed to the carrier. Most plays often featured seven, eight, nine defenders around the area of the tackle. It was an aspect that impressed New Britain head coach Tebucky Jones the most, even as the offense was responsible for scoring 21 of the team’s 35 points or the Hurricanes scored a touchdown on special teams, recovering a fumble in the end zone after forcing a botched snap on a punt. The defense also provided the biggest momentum play in the game. With New Britain’s offense struggling to get into a rhythm early and Tahje Yopp attempting to settle into the quarterback role for the first time, Kaiyon Gunn made sure the Hurricanes headed into the locker room at halftime on a positive note. Gunn picked off the signal caller with 2:33 left in the first half, after Langevin lofted a pass up the right sideline, and returned it 33 yards for the touchdown to make it 14-0. It was the second of his three touchdowns on the night. Gunn also scored twice on offense, rushing for 113 yards. Conard never got anything else going the rest of the way and New Britain only got stronger as the game wore on. Were there still things to improve on? Yes, specifically in the number of penalties the Hurricanes once again accrued. But was it a win? Yes and an important one at that. Now, New Britain will look to not only try to repeat that performance in its Week 2 matchup against Manchester, which will also serve as the team’s home opener, but top it. After all, a 35-0 win certainly provides a nice confidence boost for next week. Posted in New Britain Herald, New Britain on Sunday, 9 September 2018 21:33. Updated: Sunday, 9 September 2018 21:35.